Whether you have too many walls already covered with plaques, or no walls at all, you can create a virtual tribute wall that's richer than any bricks and mortar honour. And the story of the life being honoured stays alive, says annual giving director Elain Evans of University of British Columbia (UBC). Her moment of inspiration came during the wrap-up of a tribute giving campaign conducted entirely by mail. The subject was the late UBC professor Rudolf Vrba, one of the few survivors to escape from the camp, who helped reveal the truth of what was happening there. "We ran the campaign totally through letters," she recalls. "There was an amazing response. Then the story comes to an end and everything's filed away. That felt totally wrong." At the suggestion of Toronto branding agency Public, she began to think about a way to commemorate UBC staff and students and facilitate tribute giving online. "We wanted a page that was very powerful for families - something that would let them share materials that were shown at funerals or celebrations of life," she explains. "How could we contact, for example, the deceased's golf buddies when their only form of communication had been electronic?" Virtual memorial walls seemed to be the answer. Evans describes them as perpetual hubs that allow family, friends, colleagues and buddies to continue sharing memories and comfort, as well as running peer-to-peer tribute giving campaigns. "People can share [them] far outside the networks we can tap with printed memorial letters," Evans says. "There's recognition right on the site. That makes it so much easier for families to acknowledge the contributions." The impact of virtual memorial walls stretches well beyond money raised, she continues. "It has heart. There are touching pieces from close family members - there wasn't a dry eye in the house when staff read some of them." The virtual tributes are popular - Evans' coordinator of online giving usually launches a couple of new ones each month. Most of the activity happens during the first six weeks, but since the page remains live, families often return on birthdays and death anniversaries. Sharing is a vital part of the platform's success, Evans notes. "When friends ask friends, our success rate is eight times higher. It was really difficult for us to make the list before because we have no way of knowing a person's contacts. Social media sharing lets people who know the individual pass it on." To other charities, Evans says that virtual memorial walls are a good investment, provided you can allot some regular staff time and expertise. "Peer-to-peer can look like it's strictly an event-based fundraising tool," she advises. "But if you think about it carefully, you can make it work for whatever you need." 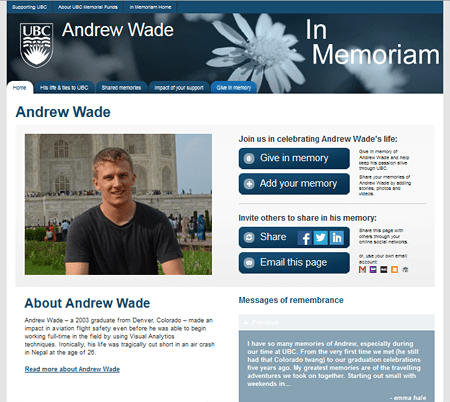 UBC's virtual memorial wall template (www.memorial.supporting.ubc.ca) was designed by British agency Homemade on a platform built by FrontStream. For more information, contact Elain Evans at Elain.Evans@ubc.ca.